With parallel processing, a separate media set is opened per each drive used. The media pool must have an available tape for each drive. If you reduce the number of drives, the media pool will use fewer drives for the next writing session. The media sets that become excessive will be closed. If you increase the number of drives, the media pool will open new media sets per each added drive. Further, the media pool will use these media sets according to rules described above. When multiple media sets open simultaneously, they may have identical sequence number and time of creation. To distinguish between the media sets easily, use the %id% variable in the media set name. This variable is added to the media set name by default. 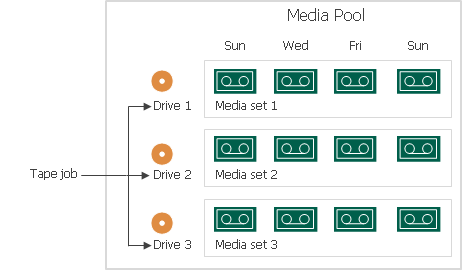 When the media pool is set to the Do not create, always continue using current media set option, a media set is opened per each drive during the first tape session. The next time a tape job starts, it chooses a tape that has most free space, and appends data to it. For example, you set the maximum number of drives to 3. The tape jobs that are first to run start 3 media sets. The following tape sessions continue these 3 media sets appending data to them. 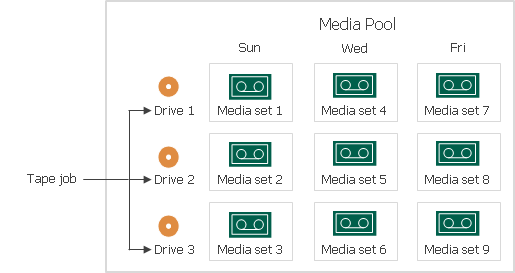 When the media pool is set to the Create new media set for every backup session option, a media set is opened per each drive for every writing session. When the jobs run the next time, they open a number of media sets anew. Each media set uses a free tape. Note that this configuration is the most tape-consumptive. When the media pool is set to Daily at option, a number of media sets (per each drive) is opened on the scheduled day. If tape jobs run twice or more before the scheduled day, they continue these media sets — in this case, the jobs use tapes that have most free space first.